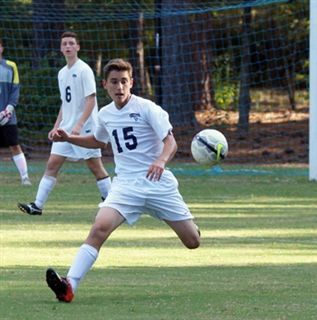 Junior Joseph Tozzi (2018) fired in 2 goals on Tuesday night as The O’Neal School boys’ soccer team defeated an organized and determined Carolina Friends School. The win takes the Falcons to 8 wins and 1 loss on the season and 6 wins and 1 loss in EPIC Conference play. Tozzi’s first goal served as an equalizer to CFS’s opening goal four minutes before half-time. A lead that came against the run of play as O’Neal’s strong offensive build up play didn’t get the reward it deserved. Tozzi’s second goal came with just 4 minutes remaining and came as a result of a penalty kick, showing calmness as time ran down. In the second half, the Falcons had to show passion defensively and in attack to come from the goal down deficit it faced at half-time. CFS played well defensively and also had their goalkeeper to thank for some terrific saves as they successfully frustrated the Falcons offense time and time again. However, Tozzi’s composure and quality won the day for a resilient O’Neal, who proved their will to compete on the road, with another hard earned victory. O’Neal next play on Thursday 9/29 against another very strong opponent and EPIC Conference foe, Trinity Academy of Raleigh. The match is at home with a 4pm kick off.